Thanks for the bug reports Tony06270 and I'm looking into them. I have the same problems as soon as I installed model pack 49. Nothing for the bug report By cons I do not quite understand how activated the player legs. example: I chose a soldier of WW2 pack and main script, body.fpi, body2.fpi or player legs.fpi, I tried the script on a ww2 soldier are many legs of active player but there is no animation. To use a body just pick a ww2 character unarmed and place the body.fpi in the main script, you can only use one script at a time. Hopefully fixed the zombie pack 10 with newer darkai fixes. to work with milliseconds or just on/off (1 or 0)? THERE ARE ISSUE WITH THIS MOD WITH WINDOWS 10. After the release of windows 10 there seems to be some issues with this mod at the moment. Thanks to your 0mb Lightmapper, now I ( and all of us ) can create great outdoor levels without being worried so much about this damn memory cap. See by yourself. For the moment, the level "only" uses 755 mb of available memory. Again S4real and nomad, you guys rock so hard. Just trying out the new release. Right clicking on marker entities enters their edit mode as normal however the box on the left is totally blank, no appear,default,destroy,ifused fields, nothing just a large blank space. But right click an 'entity' entity just hard crashes it, the generic fpsc editor has stopped working box pops, a few moments later it closes the editor down. Hope this helps track down the cause maybe as a fix would be MASSIVELY appreciated, like you saw how I gushed over the mod WITH these issues! Other than that amazing work, just building out my current pre alpha through it and cant wait to see the results. Again dont take my bugs as criticism, the whole project is awesome and many thanks go to you and nomad for the whole thing. After some further testing Ive noticed around a 5 fps frame rate drop using this version so I shall Probably revert to the Original Alpha, I noticed in the patch notes there was supposed to be a performance increase but the opposite seems true for me, particularly when using some of the static nomad shaders. @Madcow :- looking good can't wait to play a demo if you release one. @Sinister Spoon :- Thanks for your report as it helps us try and fix any issues you may have and others. We have little control over the map editor and tbh have no idea why your editor changes so much. What version of fpsc are you using for your alpha game when not using black ice mod ? Since updating to windows 10 I'm seeing framerate drops more than before and noticed it seems to be the full screen shaders that causing the issues.I'm looking into this and may improve performance for you if I can work a fix. I have little knowledge about shaders and maybe nomad will help you with this. Here a list whats being worked on at the moment. start of windows 10 fixes. 0mb lightmapping now works in windows 10. Dark ai issues now fixed for windows 10.
now compile with smaller size exe. activated memory usage in map editor. fix save and load bug. New actions and commands added. 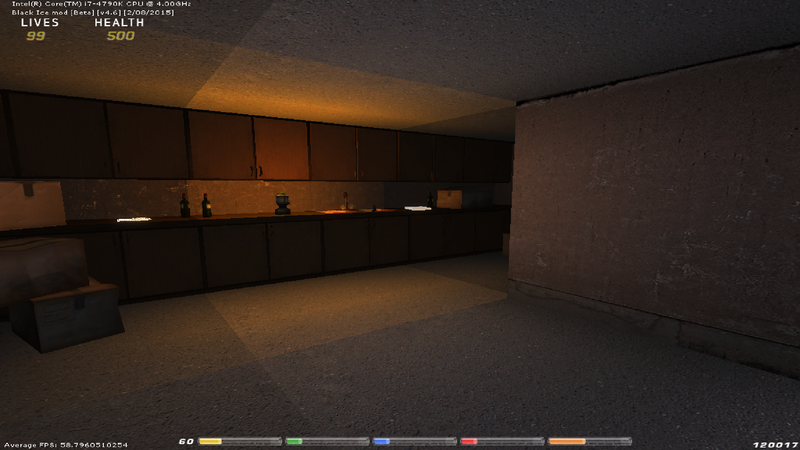 fixed static lights not working with 0 lightmapping. STATELESSER=x and STATEGREATER=x now added. 0 lightmapping added thanks to hockykid. I really love the memory saving! I was happier to save a gig of memory than a few extra bucks! Btw, will there be any more feature additions to the mod? Quote: "I really love the memory saving! I was happier to save a gig of memory than a few extra bucks! Btw, will there be any more feature additions to the mod? Thanks for the feedback , at the moment there are a few new commands and actions added to the source and can be seen in the doc's folder in a text called New script commands. We adding more commands all the time to improve your games and you can see a list of scripts that use the new commands in black ice script folder. As for features we will be looking into adding more once we feel happy how stable the mod is first. Quote: "tabs are all switched round again still, entities under segments, markers under entities"
make sure the two needed .dll files are there and then I ran V1.20 beta 17a again to be sure. After doing those the editor was ok again. New version ? or is it downloads it please? During the test game build of the Black Ice demo, there always seems to be an error at the Universe Lighting part of the build. "Error 105 - File does not exist at line 93"
I temporarily removed the LightMapper application from the FPSC directory and it loads fine. However, a few entities look pretty funky. The error doesn't stop the level from building. I can still play the level, but all segments are missing. Tried fixing the issue myself, but was unsuccessful. There will be a newer version coming soon just doing final test. Quote: "During the test game build of the Black Ice demo, there always seems to be an error at the Universe Lighting part of the build. Tried fixing the issue myself, but was unsuccessful. " That error is saying that fpsc has not built the universe.dbo for some odd reason. Have you tried and change fpscgame.exe to run as administrator and the lightmapping.exe as well. Quote: "what version of windows are you using ?" Have you tried and change fpscgame.exe to run as administrator and the lightmapping.exe as well." Yes, I went into their properties > Compatibility > and marked them to always run as admin. It's strange because this never occurred before when I was using Zeta mod on a separate FPSC. But now, it seems to happen on both Zeta and Black Ice. I know the problem lies in my computer and not the mod, but I can't for the life of me figure it out. @PixelF :- Hope you get it working , I'm not sure why its doing that tbh. New Update is now posted v4.6 with a lot of fixes and now has windows 10 support. Hello, yes yes yes thank you very much s4real script pack 10 works fine now. The legs of the script does not work with the arrows on the keyboard. Why not try to add the view 3rd person aegul's mod ? S4real thank you you are the best. I've attached a new body 3 script that uses the arrow keys as well as the wasd keys. We might look into adding 3rd person view at a later date. S4real thank you very much, you are too kind. I have the feeling that you secretely hope that is making a mod for you, am I wrong ? I just installed the new beta and my lightmapping quality is shot. All the preferences are set to the highest settings, and I cleaned out everything. I even checked the setup.ini file to ensure the lightmapattern and lightmapquality fields hadn't become really low in value. They're set to 512 and 16 and 128 respectively. Any help? Quote: "I have the feeling that you secretely hope that is making a mod for you, am I wrong ?" @Madcow : Return to your occupations and let me do the suggestions I want at least I said something constructive for all the world. If s4real to things to say it's big enough it seems. I think not secretly s4real made mod for me no no !!! @Susysyay :- Could you please put up the version of windows you are using please to help debug the problem. Seems the lightmapping not being done proper by the picture, does it when it hit lightmapping stay on lightmapping and the size of memory used or does it go threw some other lightmapping then says done. You could try and set the lightmapping.exe to run as admin and see if that helps. Before testing anymore del everything in the testlevel folder and try again. Thank you for your hard work S4real. It blows my mind how good x9 has become. I left around 1.3 updates its like learning it all over again. Quote: "@s4real : I'm using Windows 8.1 Home Premium 64 bit. The previous beta didn't have this lightmapping problem. I tried running as admin with no luck. I tried a restart on my computer and that did fix the problem temporarily. If I try to launch a large level know, it freezes on Beginning to generate lightmap universe, or something along those lines. I do see the Eetalightmapper start and appear in the taskbar, so it is running. Not sure what's going on"
Sorry to hear that you having problems with the lightmapping with black ice mod, I was worried that the windows 10 fixes for the lightmapping might effect other os. Do you have a skype account so you could beta test newer versions. This would help in further beta test before release. Increase the value to something like this. I also recommend increasing the ambient lighting in the level when using cell shading. We are looking at the lightmapping issues being reported and some other fixes to be included in the next version. There is another big feature on its way which is being kept a surprise for now! I bet it's dynamic shadows or per-pixel based lighting. Also I know why the hand Animation don't work. The handdoor was removed for the code. @ncmako :- Thanks for your comments. @DEATH GOTH SNIPER :- I'm not sure what we looking for in that picture but did notice you using v120.beta18 and that version has major issues it is recommended to use v1.20 beta 17a with this mod. The lines you talk about could be a shader issue with nomad and your graphics card but nomad has re-wrote the shaders for the next release. I can't see the problem in your image. Can I just install 17a overtop without reinstalling x9 an then reinstall black ice? My video card is x2 AIT HD 7790 at 2gb each. I was looking at my textures an my S texture was making a lot if bugs. Yeah it should be fine to install 120.beta17a over the top then re stall black ice mod. *The main black ice demo map is now dual wield enabled (flashlight, tavor, grenades). Hold left Ctrl key and mouse scroll to select dual wield enabled weapons. **Instructions for dual wield can also be found in the FPSC Docs folder so you can get this working with your own weapons. I don't know if other people are in my case, but sometimes, some lighting markers are still present ( they do emit light ) on my map after being removed. @DEATH GOTH SNIPER - Hope the new version is working well for you and should give better performance also. @ncmako - Thanks and have fun with the new version. I haven't forgotten about your awesome hand torch and will include this in a future update once I've had another look. @Madcow - We had a look at this and believe its because the new 0mb lightmapper runs on a separate executable. I confirmed if you test a game then delete a static light and test again, that light will still be included in the lightmap. There is a workaround which is to move another static light in the map slightly before testing again and the lighting will be rebuilt correctly. Also if you add any new static lights to the level it will also work. Oh, I didn't read the whole thread, sorry. Thank you. Yes it fixed it thank you. I have a small bug that use to not be. I think this is because of the glass, maybe this can help you ? Edit: all the doors must be removed and replaced then it works. I love pitas, it tastes good. I've noticed that the HUD pictures used by weapons seems to be un-affected by the re-sampling performed by FPSC when this one have to deal with widescreen resolutions. Do you think you will be able to do the same thing for any other HUD file displayed by default or by scripts ? I have updated my version of Black Ice since I took the screenshot, I wonder if you guys are gonna fix the way how the huds are displayed ? Hey S4 and Nomad, just to let you know. So as far as my personal experience goes this for me is now 100% xp compatible! So thanks so much for that guys, you saved me a boat load of work! Might actually be able to continue making the game now! As for windows 7 issues I was having, currently trying to install windows 10 on that machine which isnt going well seeing as the built in display is broken and it wont kick over to the external monitor till windows loads so Im kinda fumbling through the installation not able to see what im doing which is frustrating but cest la vie at least I have one machine on which everything works and is so awesomely fantastic I cant offer a single complaint this time! All I will say is that Id like to throw my hat in with the hud sampling issues, all my huds looked amazing on my tiny little monitor but get stretched and made horrid on the 42 inch Im displaying the laptop through. If theres no way to change the way the huds are sampled how about the option to just lock them to their original resolution so that instead of being stretched on a larger display. The hud remains the same size? Im pretty sure that we can script in the hudsize in the hud definition scripts, but the ability to make huds able to move, scale and rotate etc dynamically is really one of the only things holding FPSC back when compared to other engines which are capable of so much more complex and better looking 2d work than FPSC has ever been. Its a feature Id love since my games are screaming out for little puffs of smoke, wiggly hud items, glowing, scaling, rotating etc. You guys made fpsc so damn freaking awesome on the 3d lighting and optimization front that the HUD issue is brought into much sharper focus when your playing along and enjoying all the optimization tweaks and gorgeous shaders and lighting then these lack lustre 2d static 2d images get plastered over it, badly scaled and in desperate need of being jazzed up. But anyway. Once again this Mod has saved my entire project so im eternally grateful regardless!!! Many Many Many thanks! Quote: " I wonder if you guys are gonna fix the way how the huds are displayed"
everything in the game would be set to this resolution. @Sinister Spoon :- Glad everything is working for you in the new version. Using this resolution deforms the hud pictures but makes also the screen very aliased and stretched (even with aspect ratio turned on ). That's why I would like to stay in a widescreen resolution. This should set all the hubs and everything else to this resolution. The only problem with settings resolutions to high can make your game crash on certain machines if there monitor does not support that resolution. The huds are still re-sampled. There is no way to play an FPSC Game in widescreen resolutions without having this issue ? I'm not sure if this can be fixed as hubs are a texture at the end of the day and would have to be re sampled to go with what resolution you set. I have a look at the source and see how this works. Hey there, back again after much testing and even reinstalling fresh from scratch and just updating the v1.20 beta 17 and the beta 4.7 black ice on a totally blank fpsc directory. I use aspectratio=1, and set the height and width manually on my builds to always fit my monitor, but hud images always get stretched instead of remaining at their preset aspect ratio. Admittedly I havent tried specifying hudsize=x etc in the hud definition line but thats an inelegant solution at best. I was just curious if you guys had any way that wasnt going to cause too much headache or work for you, to change the way they're rendered entirely, as dynamic huds are something people have requested for an eternity, say tying a hud image to the arrow keys and being able to move it around, or load in gifs as a hud image so simple smooth animations dont require 30 huds scripted to show/unshow in sequence. I mean moveable huds arent really that much an issue but the gif idea I personally would benefit HUGELY from. On a side note, and believe me I dont wana seem ungrateful, Im sure this is a lot of work for you guys and seeing a stream of complaints everytime you release an update could be demorallising but I need to raise an issue again with the optimization thats going on, as whatever it is you guys are doing behind the scenes on the mod to optimize it are having a steady detrimental effect on the frame rate im getting, from the Alpha to beta 3.2 (I think it was?) I lost an average of 5-10 fps over my previous build from the Alpha, and on the 4.7 beta its now down a total of around 12-18fps, so where I was getting 40-50 previously, its down to between 20-30, changing the lightmap to performance does nothing to increase the fps, neither does changing the texture quality, turning off shaders however DOES. On a simple test room of a 3x3 scifi room that comes stock with the mod (nomad sci fi room?) I get an average of 52 fps (love the new tab features that display processor etc and average fps, though in a built game they break all fpgcrawtext just a heads up there unless I redefined all the hud size, font, etc on each line of text the fps display overrides it and makes game text unreadabley small) But yeah, 52 fps on a 3x3 nomad mod sci fi room with no shaders, 29-30 fps if I turn shaders on and as I say performance lightmapping and texture quality changes have no effect, its just a 20 fps reduction with shaders on. I guess it must be my system thats incompatible, but if a 3x3 room with shaders on produces 30 fps with nothing else in the level I seriously doubt Im ever going to actually use the shaders if I have to sacrifice 20 fps for them. Im on a quad core i3 each at 2.4ghz, 2gb ram, 750mb onboard graphics, all intel hd based on a x64 win 7 os. So yeah I know the laptop aint great but previous versions actually did boost my fps considerably but now its worse than just stock fpsc at v1.20 so I dont know what gives. other than that it works perfectly. I think Im going to have to wipe my fpsc directory, uninstall and go back to the Alpha version, I just built out the test room I was fiddling with to see if the fps issue was linked to the editor but no, it was even worse in a built game "Highest fps achieved 17" says it all, in a 3x3 room, with 4 lights, one in each corner set to static and a radius of 150, nothing else at all, and 15fps average... I mean that cannot be right..
With that in mind there has to be something going wrong internally somewhere, some incompatability with my graphics card Im assuming? But it simply wasnt there in previous versions of the mod, its something thats happened with the latest 2 iterations of the beta only, Seems I was over enthusiastic on the resurrection of my project. As much as we want the mod to run well on all machines, its important to remember we are trying to achieve the best visuals possible and the shaders play a significant part in this at a performance cost. To be fair your laptop does not meet our recommended specifications (see 1st post) and I don't recommend any serious gaming or game development with integrated graphics. A dedicated graphics card is a must really. There has definitely been a speed improvement between v4.6 and v4.7 after the optimizations I made to the shaders which now use less instructions. We found an average increase of around 5-10fps on the machines tested. My advice would be to consider using the mod but with the stock FPSC segment and entity shaders (pixel shader 2.0) which I also updated to support dynamic lighting and consider switching off post processing in the setup.ini file. This should give you much better performance. Having said all this, its interesting to hear you had better performance with the alpha so I will also run some tests for comparison. If there is anything obvious going on there I'm sure we can fix it but there is no performance drop for me between the latest beta's.